We are putting on a local community Concert in Warlingham just south of Croydon. 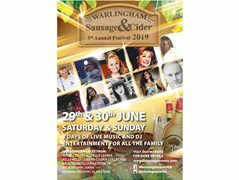 With some 80's & 90's pop stars, if you are looking for exposure to be working along side some established pop stars, a few booking agents also being present which may lead to paid work... Drop us a line the dates are 29th & 30th June 2019 12-7pm. We are looking for experienced dancers or dance troups. This is a non paid gig.